Energy-saving light bulbs are so dangerous that everyone must leave the room for at least 15 minutes if one falls to the floor and breaks, a Government department warned yesterday. 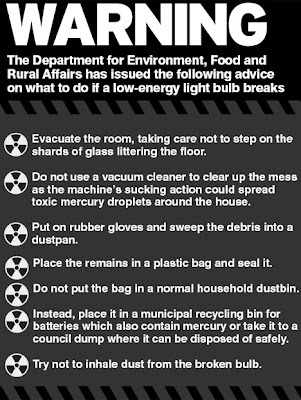 The startling alert came as health experts also warned that toxic mercury inside the bulbs can aggravate a range of problems including migraines and dizziness. A leading dermatologist said tens of thousands of people with skin complaints will find it hard to tolerate being near the bulbs as they cause conditions such as eczema to flare up.. The Department for Environment warned shards of glass from broken bulbs should not be vacuumed up but instead swept away by someone wearing rubber gloves to protect them from the bulb's mercury content. In addition, it said care should be taken not to inhale any dust and the broken pieces should be put in a sealed plastic bag for disposal at a council dump & not a normal household bin. None of this advice, however, is printed on the packaging the new-style bulbs are sold in. There are also worries over how the bulbs will be disposed of. Under new regulations for hazardous waste, councils are obliged to recycle them. At present, they should be placed in special bins also used for batteries at a council dump. But in future, councils will have to provide a collection service or install special recycling banks for the bulbs. There are fears that without a proper disposal system, the mercury content could contaminate water supplies. 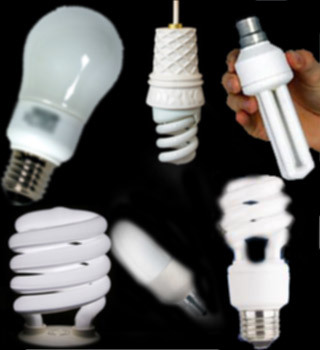 Independent environmental scientist Dr David Spurgeon warned yesterday: 'Because these light bulbs contain small amounts of mercury, they could cause a problem if disposed of in a normal bin. 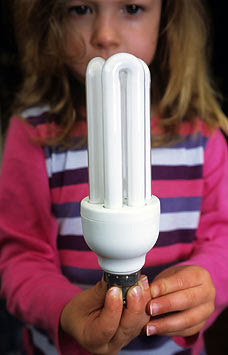 And dermatologist Dr John Hawk, told BBC Radio 4's Today programme that some people already find it difficult to tolerate the fluorescent-strip lighting that is widely used in schools and offices, which works in the same way as the eco-friendly bulbs. He said: 'Fluorescent lights seem to have some sort of ionising characteristic where they affect the air around them. 'This does affect a certain number of people, probably tens of thousands, in Britain, whose ailments flare up just by being close to them. Certain forms of eczema, some of which are very common, do flare up badly anywhere near fluorescent lights, so these people have to just be around incandescent (old-style) lighting.' 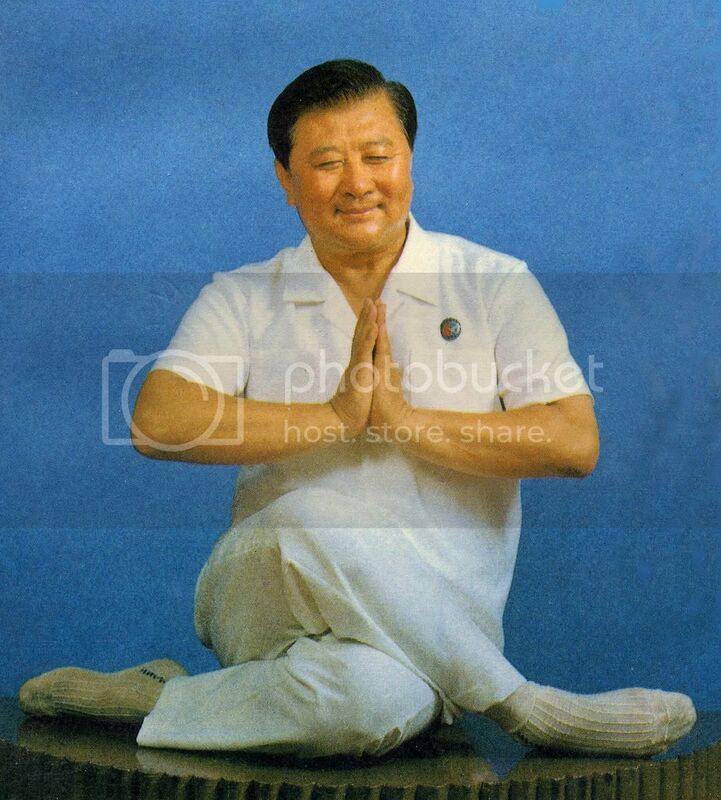 To read more, click HERE.